1. 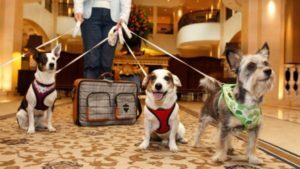 Search for Pet friendly hotels: there are several online databases that cater to traveling with Fido. 2. Do your research on the hotel: double check what the hotels pet fees and restrictions are some of them may be non-refundable. Scope out the surroundings to ensure there is adequate area to walk your dog. Many chain hotels are along busy highways which could be a recipe for disaster. 3. Ground floor please! Request a ground floor room. This is purely for convenience when you have to take your doggy for a late night potty run. Also, make sure to ask the about pet extras that the hotel may offer. This could include dog-sitting, treats, even spa services. 4. Be comfortable! Ask for suite hotel rooms. This will ensure for extended stays that you and your pup will have lots of room. Be sure to ask about “pet rooms”. A lot of times “pet rooms” = smoking rooms with worn furniture. You are paying hard earned money for a nice hotel stay so make sure to ask for it. 5. Use a crate. To prevent any hotel damage you would be liable for, crate your dog when you are not in the room. Be sure your dog has adequate water, and make sure to check on them regularly. Please note, some hotels prohibit a dog being left alone in a room. 6. Be aware! Ask about room cleaning service and specify times you do not want your room entered. You need to control who can come into contact with your dog, especially if you are not there. 7. Have a back-up plan! Always have an alternative, just in case. Better safe than sorry! 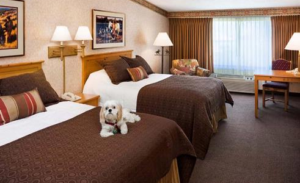 With these tips you can have a safe and stress free hotel stay, furry friend and all. Travel with confidence and enjoy your stay!